We're On The Road to WrestleMania, and to celebrate WWE’s 35th annual Showcase of the Immortals HOMAGE is releasing new WWE retro tees all month long. Just yesterday HOMAGE released this epic, limited edition “Shawn Michaels From High Above” photograph tee that pays tribute to one of the most legendary matches of all time – the famed WrestleMania X ladder match between HBK Shawn Michaels and Razor Ramon. 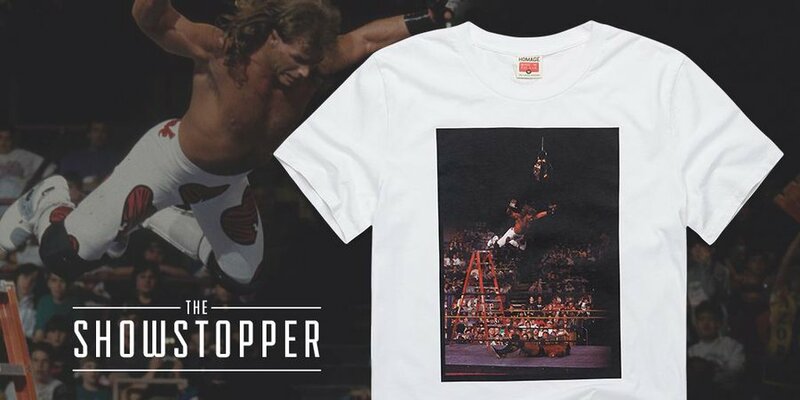 Limited to just 175 pieces, the WWE “Shawn Michaels From High Above” photo t-shirt is currently available at the HOMAGE online store, sizes S-3XL, for $36.